When developing custom learning games for clients, artists like myself are sometimes given the direction to make art that “looks like all the other Filament games.” While some of our past games share similar styles and visual characteristics, the truth is there is no one “Filament style” that is common across all our previous games – rather, our “style” is inclusive of a variety of different art approaches, dependent on the unique vision and goals of each project. 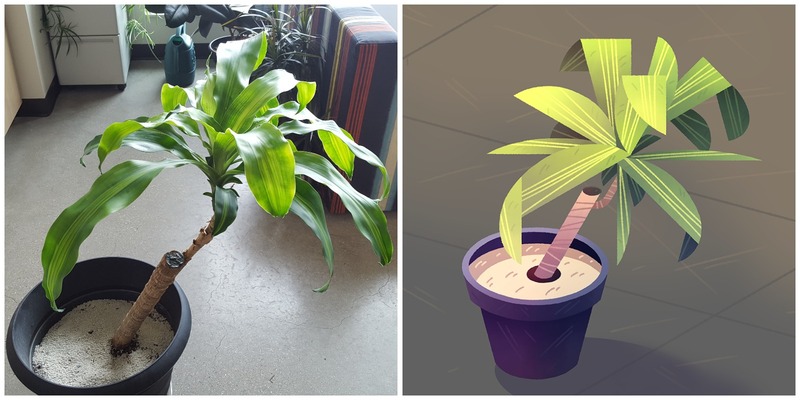 To illustrate this, I travelled around our office and illustrated four of our studio’s plants, each in a distinct style. As an added bonus, our talented Sound and Video Engineer Josh Bartels composed four original songs to accompany each piece, giving each illustration its own unique flavor. Four styles, four songs, four moods – check out the speed sketches below, and let us know which aesthetic is your favorite! My first illustration depicts a leaning corn plant (Dracena fragrans) located in our office kitchen. I used a lot of straight lines and geometric shapes to give the sketch a flat and structured look (something you may find more commonly in magazine illustrations rather than video games). I used a similar style when creating art for Morphy, a sidescrolling platformer we developed for the Smithsonian Science Education Center. This particular plant has a storied past – at one point, it was accidentally knocked over and the top part with all the leaves tragically broke off. Despite our office-wide belief that it was likely dead forever, within a few months it had grown back all its leaves and achieved a (nearly) full recovery. I like its tenacity, and it’s looking very fresh these days. 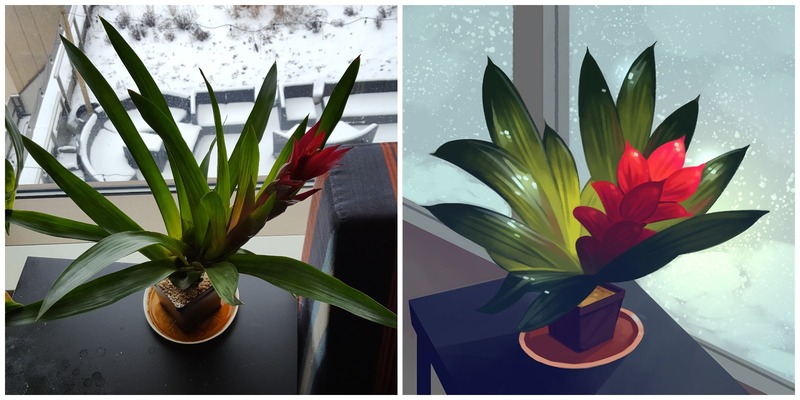 Next, I wanted to pick a more colorful and vibrant plant to sketch – eventually settling on the Bromeliad (Guzmania lingulata), as I really liked how its bright red flower was juxtaposed with the snowy, gray world outside our windows. The style for this one is simply blocking in color and highlighting the edges, while also making sure to pay close attention to the way the light was reflecting off the base of the leaves. This style is closest to how I naturally choose to sketch, meaning this piece resembles concept or pitch art more closely than any particular game. I don’t often use contour lines in my work, however I thought it might be fun to try using them for this sketch. This style relies heavily on thin janky lines for most of the visual interest, complemented with a more subdued color palette. 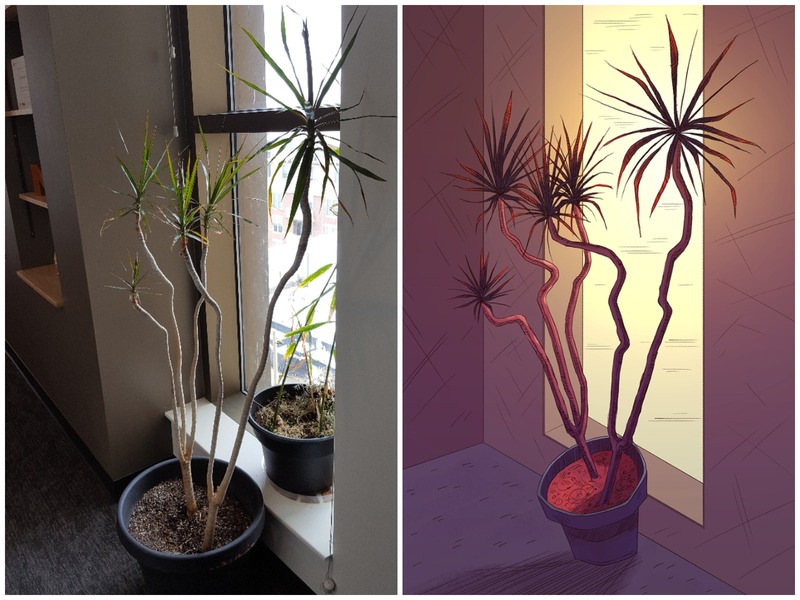 When I was capturing the image I would later base my illustration off of, I noticed how some of the branches of the tree were shadowy despite sitting directly in front of the window. I tried to capture that in my sketch by placing a gradient over plant and setting the blend mode of that layer to color dodge. This brightened the colors of the plant, while not affecting most of the dark areas, creating a really interesting and neat looking contrast. 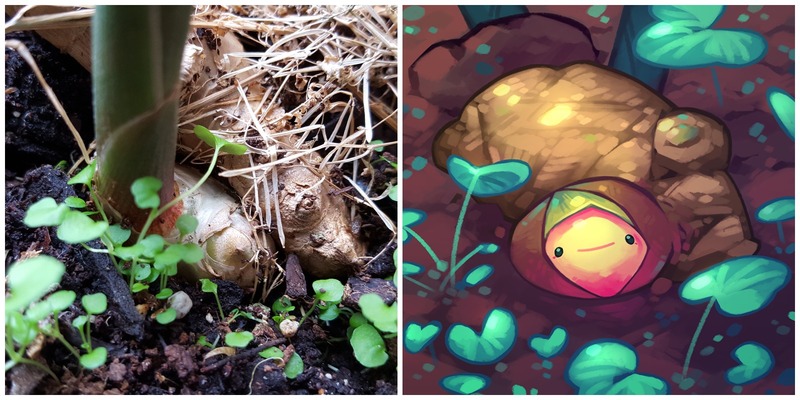 This ginger illustration looks more like a typical Filament-made game than any of the previous sketches – similar to Crazy Plant Shop, for instance. I used a pretty chunky brush and tried to emulate a “painterly” look by having the strokes blend together in a way that resembles real-life paint. When making kid-friendly art, it’s important to keep your sketch bright and colorful – an expressive face goes a long way, too. More plant history: this particular ginger plant was actually a root that my brother bought from the grocery store years ago. Rather than eating it, though, he accidentally left it on top of the fridge where it soon sprouted into a full-fledged ginger plant. I brought it in with me to work one day, and now we celebrate an annual office-wide ginger harvest.